The XK8 is the V8-powered successor to the XJS. It was Jaguar's grand tourer two door luxury car with power windows, steering and a multi-adjustable seat. The XK8 was the first model produced in the XK series. 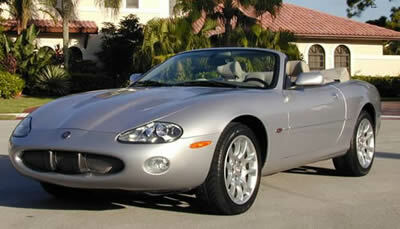 The Jaguar XK8 and XKR were produced from 1996 to 2014. The first generation of the series, the XK8, replaced the XJS and was available as a coupe and convertible. 2006 brought an aluminum bodyshell to the lineup in an effort to reduce weight and improve performance. The XK8 came with the AJ-V8 engine, available in displacements from 3.2 to 5.0 liters, and a supercharged version was available starting in 1998. The AJ-V8 used Nikasil cylinder linings, but high-sulfur fuel caused significant wear, and Jaguar replaced the Nikasil liners with iron cylinder sleeves. Top speed on the XK8 was limited by the factor to 155 mph, although even the normally-aspirated base models are capable of higher speed. The top-end supercharged model, XKR-S is capable of almost 190 mph. Over 90,000 XK8s were produced over the life of the model, and as with other Jaguar models, the continual improvement process means that later models tend to be nicer and more desireable. We have the most accurate Jaguar parts catalogs on the internet so that you are able to find the correct part for your XK8 every time. Check out our complete line of new and used Jaguar XK8 Parts.